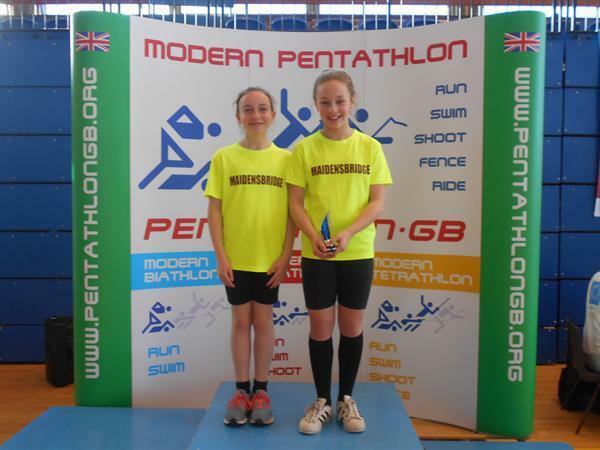 Three of our Year 6 pupils travelled to London this weekend to compete for the school in the British Schools Modern Biathlon Championships at Crystal Palace. 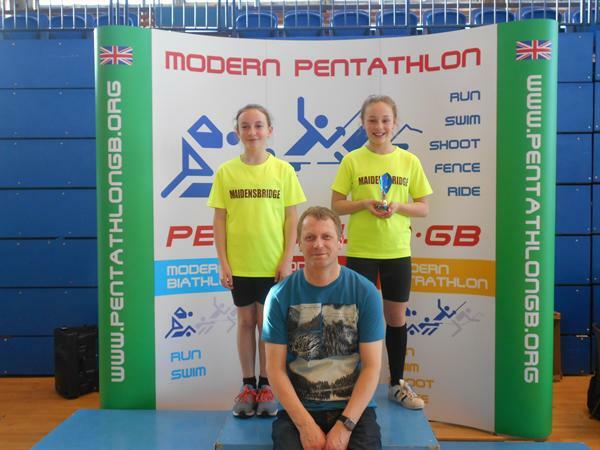 Amie, Erin and James had qualified for this national event through their performances from September in various regional and national competitions. 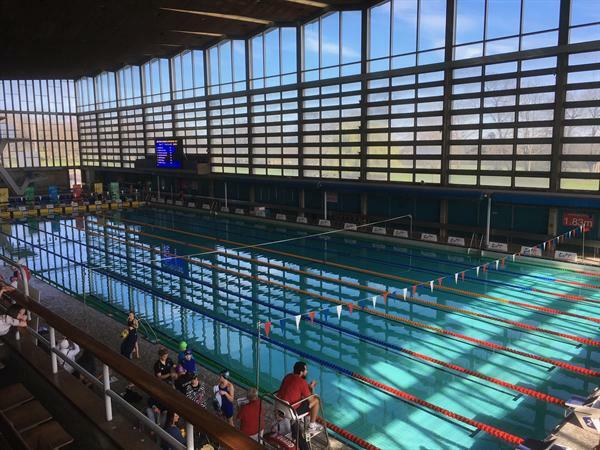 Nationally, over seven hundred boys and girls have taken part in under eleven age groups this year, with only the top 186 girls and 177 boys invited to compete on the day. 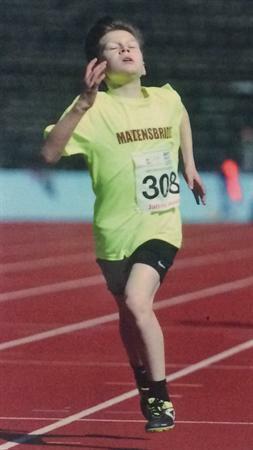 On both days, a thousand competitors were in action in all age groups. The biathlon is one of the toughest multi-event sports for all ages and requires competitors undertake a separate 50 metre swim and 800 metre run where points are awarded for an individual's performance against the clock. The highest combined score for both events is the winner and so on. 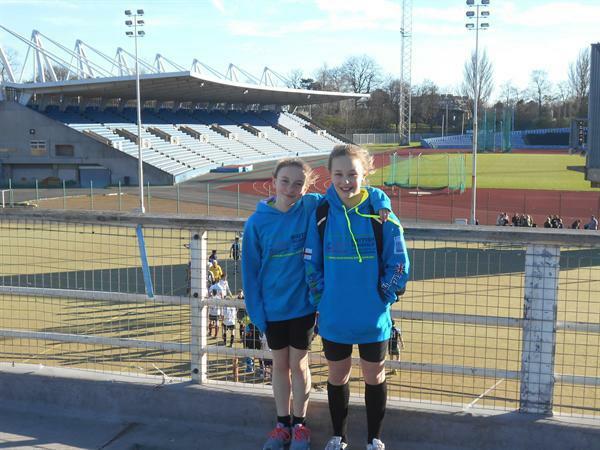 On Saturday, it was Amie and Erin's opportunity to show us what they could do and this started with the 800m. The setting was the famous sixteen thousand seat Crystal Palace track; a place that has hosted legends of track and field as well as a string of world records. It was therefore a far cry from our training track at The Dell Stadium in Brierley Hill. 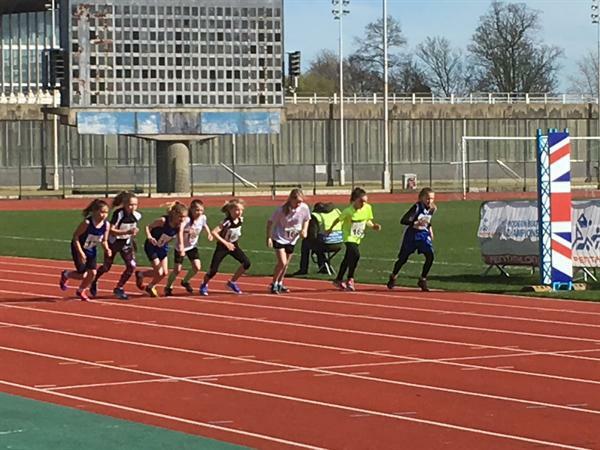 Up first was Amie, who had again felt the effects of a niggling injury during the warm-up and sensibly decided to pull out of the race after a few metres and enable her to take part in the swimming later in the day. It was a very difficult decision for Amie and she should be congratulated for the maturity shown. Erin, following her recent win in the Dudley Schools' Cross-country Championships, was quietly confident that she could again use the tactics she employed two weeks ago to propel her to a new personal best time. After going out hard and establishing herself in a comfortable second place, she kicked from 150 metres out from the finish to win the heat and record a new personal best of 2:51.25s. She took five seconds off her previous best. 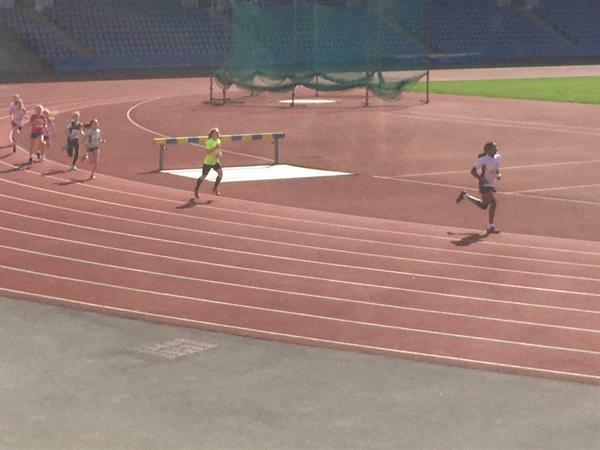 On Sunday, James had to contend with a strong breeze that formed a headwind on the back straight during his 800m heat. 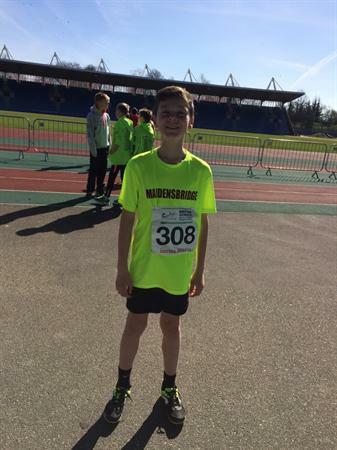 However, he worked hard throughout the race to finish third, but in the process taking an incredible seven seconds off his previous PB. A well deserved outcome given the way that he has prepared for this event in recent weeks. The swimming over the two days presented an additional challenge to Amie, Erin and James in that they would be swimming in an Olympic pool for the very first time. Additionally, it was quite an experience to swim in a pool that had electronic timing that fed back to a large screen their name and time. However, 50m pool times are slower than those produced by two lengths in a 25m pool. Amie, took to the pool first and was looking to put her disappointment in the 800m behind her. 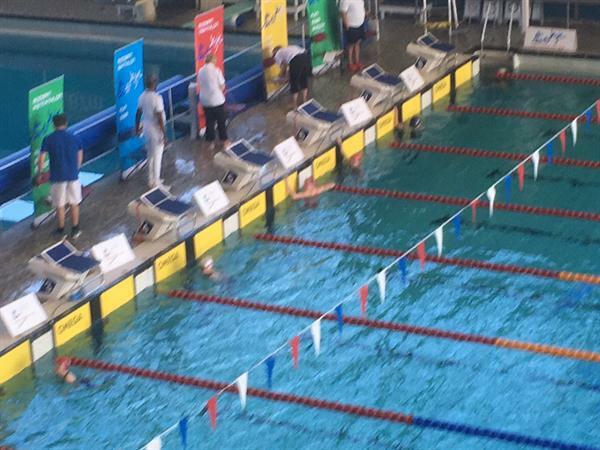 She got off to a determined start and competed hard down the length of the 50m pool. She took 0.13 seconds off her previous best in what is regarded as a slow pool. Excellent! In the final heat, which has the fastest swimmers competing together, Erin demonstrated in the larger pool what she has consistently shown in the shorter 25m pool. 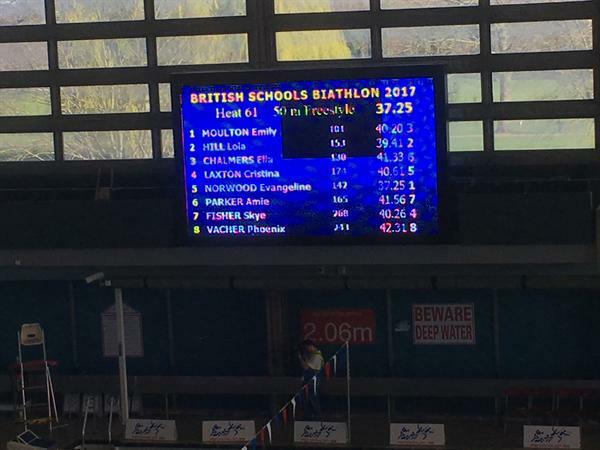 After getting off to a flying start and swimming impeccably, she finished third in her heat, the third fastest swimmer overall and with a new personal best time 32.06s. James, whose stronger event is the 800m, was a little anxious before his heat, but swam solidly to record a time of 47.42s. Just a fraction outside his personal best. Once all the competition had completed, it was an anxious wait for all concerned as the combined swim-run scores were totalled and checked. This would help decided the winners and medalists, as well as show how everyone had done their very best on the day. James finished up in 78th place which was an excellent finish well inside the top hundred places. 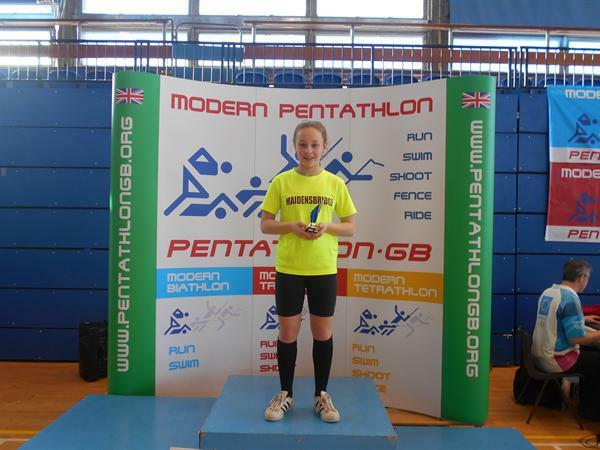 Amie, unfortunately wasn't able to record any performances in the 800m, so she wasn't able to be placed over two events. 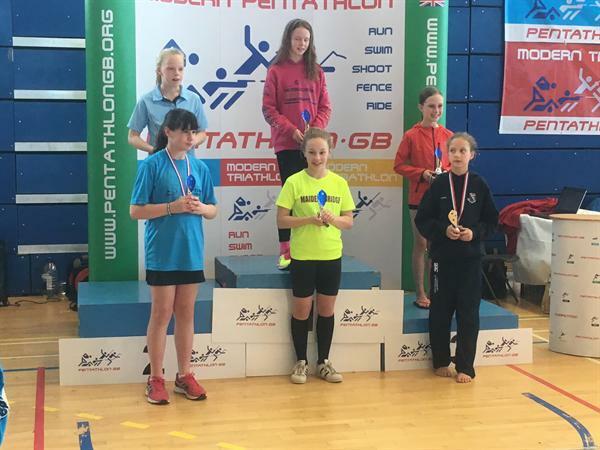 However, the travelling Maidensbridge contingent absolutely delighted to learn that Erin had come fifth overall and, as it is the practice in modern pentathlon, she would stand on the podium with the top six girls in Britain. The sport of modern biathlon, like modern pentathlon, is dominated by private and prep schools which have facilities and a curriculum that are geared for year-on-year success. However, this weekend three talented Maidensbridge pupils did something quite extraordinary to show what can be achieved in very different circumstances. Many thanks to the parents of Amie, Erin and James who have gone to great lengths to support them this weekend and throughout the biathlon season. Thank you.